I firmly clench the iron rail on the upper gallery and carefully lean forward to get a better view of the cannon that once, marking the entrance of the king in Henry VIII, sparkled the fire on the thatched roof which burnt the entire theatre to the ground. Shakespeare’s Globe Theatre. 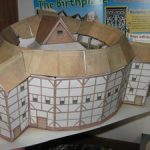 Almost 400 years later, the American actor, director and producer Sam Wanamaker set the Shakespeare Globe Trust and in 1997 modern Globe Theatre opened its entrance to Shakespeare’s followers, lovers and connoisseurs all over the world. Now it’s 2016 and I am finally at its door. A modern yet incredibly old theatre awaits – oak is cut and fashioned according to the 16th-century practice and assembled in two-dimensional bays, oak laths and staves support lime plaster mixed according to a contemporary recipe, the walls are covered in a white lime wash and the roof is made of water reed thatch. I carefully touch the walls, the floor, the seats, I look around and cannot believe my eyes, but the hard surface of the wooden benches quickly brings me back to reality (no worries though, when watching a play, comfortable cushions for the seats can be rented for only 3 pounds :)). The circular stairways bring us down to the ground level and the stage. The stage is projected halfway into the “pit” or the “yard” and has two majestic “Pillars of Hercules” that support a roof called the “Heavens”, painted with stars, moons, and signs of the zodiac to reflect the Renaissance belief in the influence of the movements of the stars upon the world below. (Should I start looking differently upon astrology?!) The yard is made of cobble stones just like in the old days and is of course roofless allowing the daylight for the afternoon performances. In the evening, however, special lights illuminate the whole theatre to recreate daylight (not that necessary during the summer for it gets dark around 10 pm :)). We surely do. As the past and present intertwine, and fantasy changes the reality, I begin to question my parts. “Don’t do it, Kate”, somebody shouts cheerfully from the audience bringing me back from my wandering thoughts. Alas, she does. This “shrew” is successfully “tamed” only to summarize the play’s view of marital harmony, in which husbands provide peace, security, and comfort to their wives, who, in return, provide loyalty and obedience. Hmmm…. this is debatable. Nevertheless, it calls for a completely different story. And a completely different sentiment. 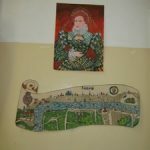 May brought distant reflections of renaissance to our school – as we decided to join the global activities marking 400 years since Shakespeare’s death and to dedicate the whole month to them. 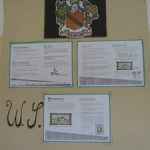 The school corridors and the main hall flourished suddenly with all the richness of Shakespeare’s words. We could read his quotations everywhere. 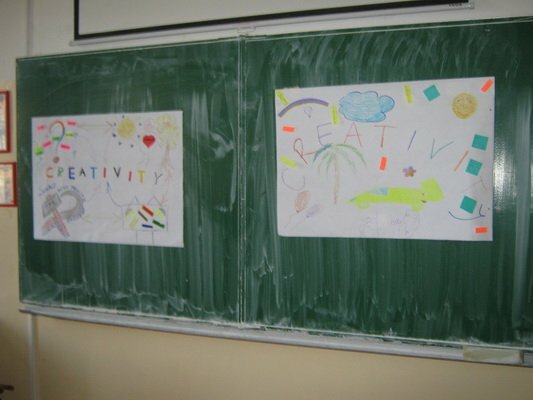 We could enjoy the students’ creative drawings and paintings of the scenes from his plays. 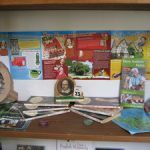 To remind ourselves of the customs of Shakespeare’s country, class 64 held an English tea party and invited their parents. 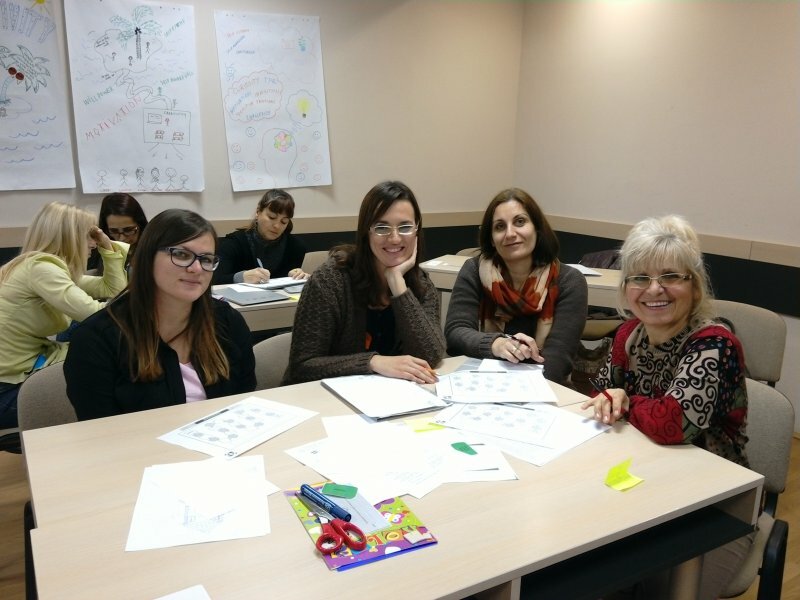 We baked shortbread biscuits, made some tea and prepared a presentation with quotations from Shakespeare’s plays and each student has his or her own quotation to tell in both English and Serbian. We listened to English renaissance music. The performance of “Romeo and Juliet” was the highlight of the month. Tens of students and several teachers had been working hard for weeks to achieve the perfection we saw on the stage. You didn’t have a sense of watching the students’ play – it was a work of professionals. Lovely girl Julia, cheerful Romeo, dignified Paris, nervous Tybalt and witty Nurse took our breath away, just like other young actors with their minor appearances on the scene. Their costumes, the scenery with Julia’s balcony all grown in red roses, the might of the music that accompanied each scene joyfully or dramatically, were all breath-taking. 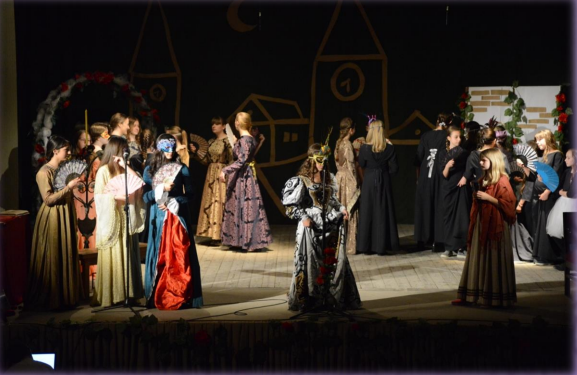 Shakespeare lives in 2016… in Kikinda! 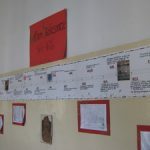 In April and May third- and fourth- year students of the social studies and language course of “Dušan Vasiljev” Grammar School in Kikinda marked the Bard’s anniversary in several ways. 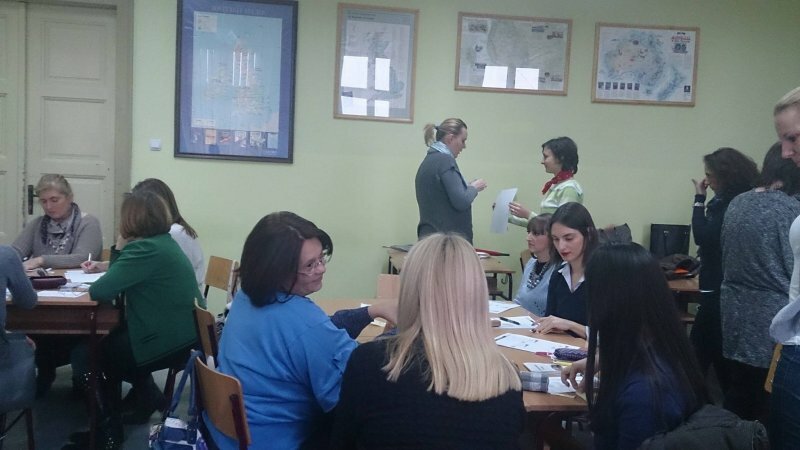 With their English teacher Dragana Bursać Ivetić they prepared a mini Shakespeare play quiz, a selection of the best quotes and a short biography, and displayed them in the school hall. 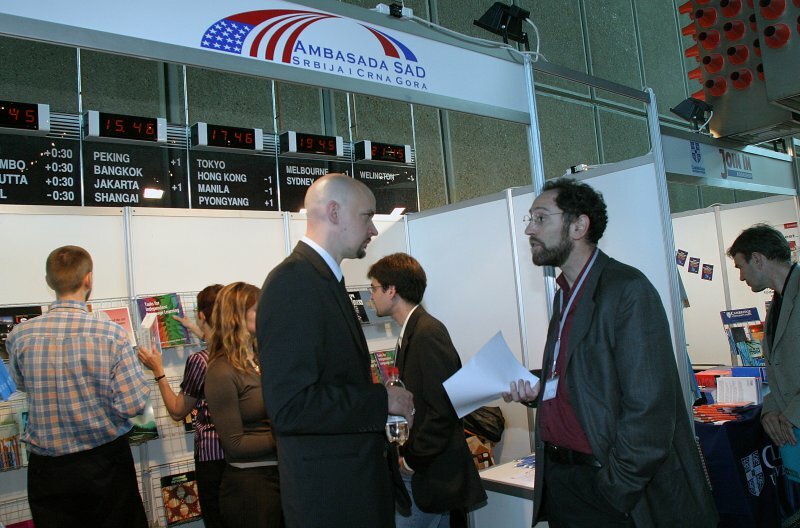 In their English classes the students saw two films based on Shakespeare’s plays and a few famous monologues delivered by Serbian actors in “Nedeljnik”, and had discussions on them. 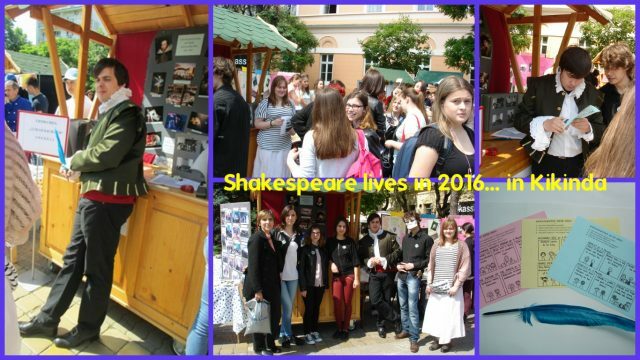 On May 10th “Shakespearing” final year pupils of primary schools took place in Kikinda Town Square: Shakespeare himself signed and stamped quiz leaflets for those who did his mini play quiz well. 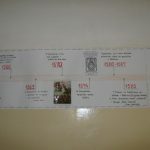 Master Will was assisted by three girls and modern Romeo and Juliet, who helped primary pupils find correct answers. 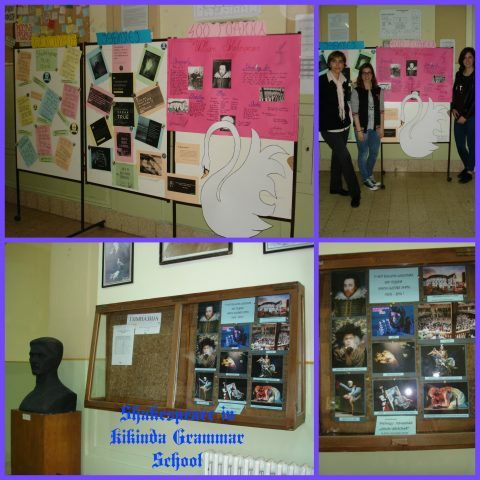 A selection of most interesting photographs concerning the Bard and his plays (including “Shakespeare lives in photography”) is exhibited in the school entrance hall, next to Dušan Vasiljev bust, throughout the year. 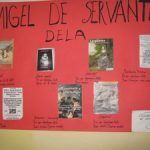 Since the 23rd of April, 1616 was the day when the world lost two great writers, William Shakespeare and Miguel de Cervantes, the students of the Užice Grammar School, as enthusiastic as can be, together with their English and Spanish teachers marked 400 years since the death of the two bards with a joint programme. Apart from the exhibition illustrating the life and work of the poets, we put on a 50-minute playlet in both the languages performed by about thirty students of all grades. 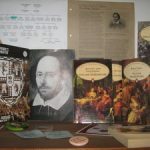 It was basically a story of Shakespeare and his imaginary conversations with Christopher Marlowe, Ben Jonson, Queen Elizabeth I and Miguel de Cervantes, all seasoned with some Renaissance music and Shakespearean poetry. It was really amazing to see how attentively the packed audience listened to the actors trying as hard as possible to understand the wisdom words of ‘not of an age, but of all times‘ coming from the stage.